Does anyone else have a problem with the too long leveling jacks. Put the back ones down by letting the tongue down to the ground and then have to lift the whole front of the trailer in the air while the bride swings the front ones down. 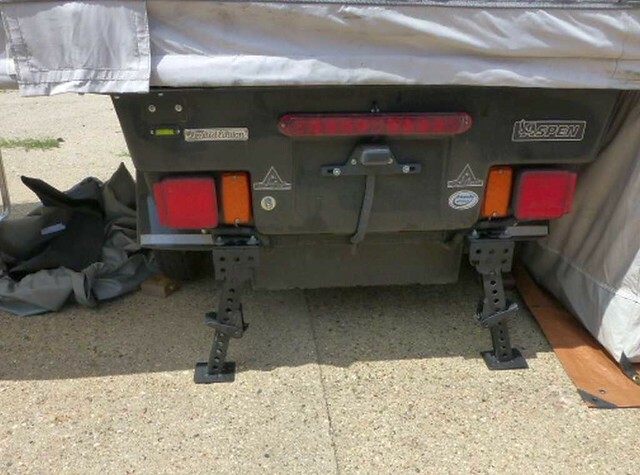 They are just too long and one only has to extend them an inch or so to set the trailer up.. Yes, they are a bit of a problem. 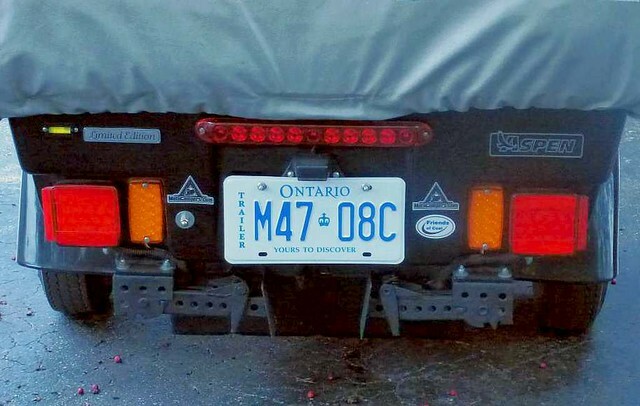 I have a stand on the tongue that came with the trailer (optional) and lower that 1st, so I don't have to hold up the front of the tongue when I unhook from the bike. To solve the issue, there are two solutions as I see it. One is an easy solution and the other involves a lot more work! The easy solution is to carry a couple lengths of 2 x 6 boards and run your camper up on those at the campsite. This should give you enough clearance to easily deploy the stabilizer jacks. 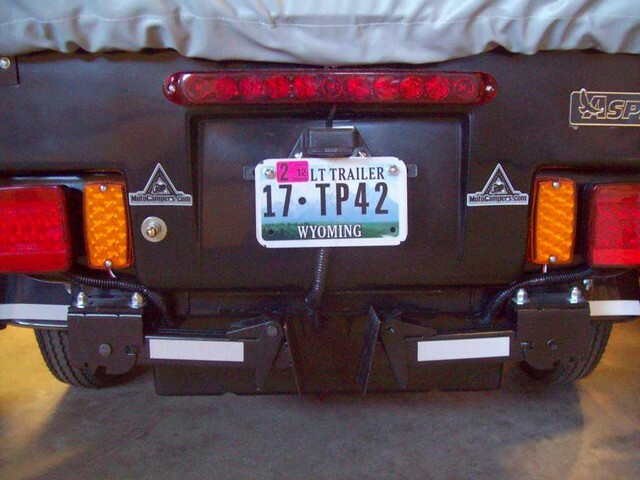 My friend on another forum did this and swapped his modified ones out off of his camper and gave them to me and he was going to do the same mods to the ones that came off of my camper before he put them on his. 13 inch tires will also cure the problem. Thanks for the photos. I am first calling Aspen as we just got this trailer new. Being it is a NOTED problem and the camper Buck got had 1" shorter stands, measured by Brady Mann, one would thought they would have fixed or at least acknowledged the too long stands. The stands if fully extended would make a person have to have a ladder just to get into the door. Push comes to shove I will just section them about 2". Until then the 2X4 thing should jury rig the problem. Talked to Aspen today. Their answer was a dowel rod placed in the coupler to prop up the front while you put down the front levelers. Makes me wonder if they know they are too long but cannot find a supplier that makes them a couple inches shorter. If I remember correctly this was brought up at the IL M&G and the demonstrator trailer that Buckfarrack bought were an inch shorter. I have the feeling that I am going to remove them from my trailer and section the outer tube 2 inches and shorten the inner tube also 2 inches. Cutting 2" out of the center would be easier than dealing with the end pieces. Gary, if you are having enough trouble to go through all that cutting and shortening, give this cure a try. Changing the tires would be a lot easier and you can get a lot better highway tire in the 13 inch size in my opinion. After seeing pictures of Larry's set up with the 13" tires, I thought I would try that and it worked like a charm!! I got 2 13" rims and tires off EBay for $129. The tires are regular trailer tires and I suspect they wont last long, but looking forward to putting on a decent radial tire with a little smaller sidewall as an 80 profile tire is a little to tall. a radial tire on this thing would last forever. It tows well with the 13" tires and the leveler issue is a thing of the past!! I am working with Brady about this problem. We have been swapping photos back and forth. He thinks there is no problem. He wants photos of the trailer on concrete so I will take them. Putting 13" tires on it would probably help but when Estella retired we lost over half of our income. The camper was her/our retirement to us. Like I said here and to Brady, if push comes to shove I will section the stands and solve the problem. He says it would be a problem sectioning them. He says the spring inside would have to be modified. Hey if someone made them to begin with someone can rebuild them. I find it hard to believe that everything is correct on this trailer. It is just way too hard to put the thing on stands. Having to lift the tongue almost a foot to get the front stands to swing down with the back stands down and fully retracted is what I call bad design or a problem. Once they are down leveling is no problem. Just a little tug on the low corners until the level is centered in both directions and we are done. We will have to tow it to some flat concrete and take pictures. My shop is taken up by a big welding project for the Bride. 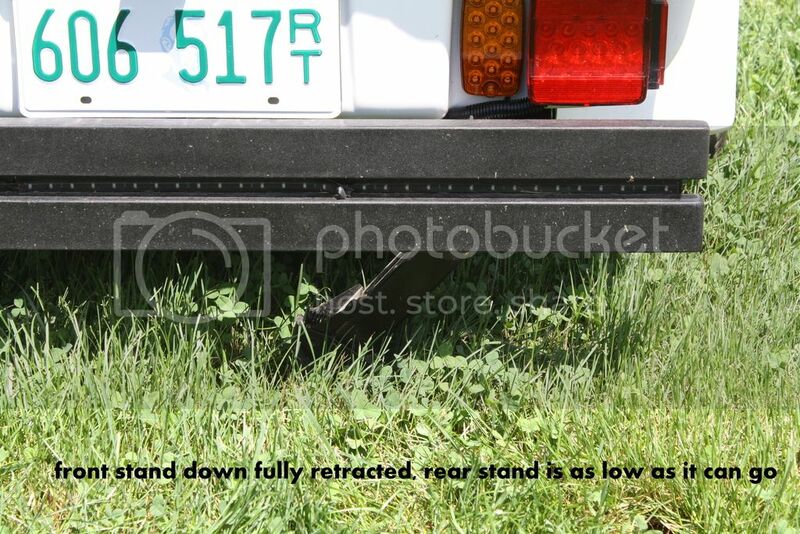 Gary, I certainly can't relate to your problem as my camper was bought used and already had the 13 inch tires on it. It has plenty of room to lower the stands and I know that I would not like to have trouble putting the stands down. Hopefully you can get your problem solved some way. Me personally, it would be worth the $200 to go with the larger tires! Just now noticed that you are lowering the rear stands first. Try lowering the front stands first. Step one in set up instructions. If it was anything like mine was, Lowering the front first was impossible as there was no way to raise the rear enough to get the jacks down. I don't think there will be any new 13" wheels for me any time soon...I kinda like the pretty 12" ones I have! Them there wheels sure are purdy!!!! I will be getting some first hand experience with the leveler jacks tomorrow night in northern Ohio, it will be our very first setup with the "new to us" Aspen Classic. I think I might take along a couple of 2 bys just in case it gives me a problem. 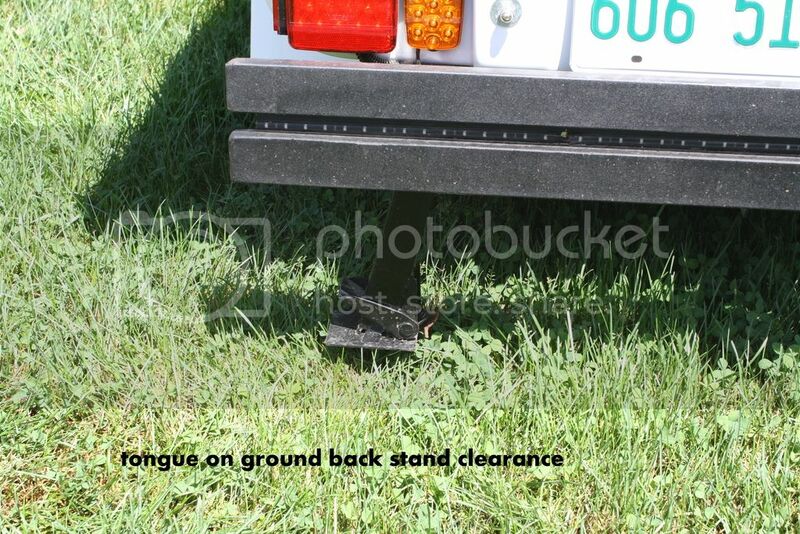 With the tongue of the trailer at the ball height of 16 in, the front legs will swing down and spring into the locked position with about 1 in of clearance... the rear legs will not swing down. 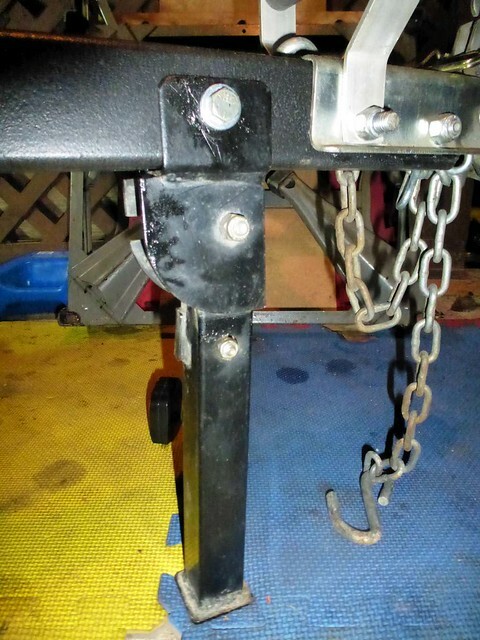 If you remove the trailer from the ball and allow the trailer to sit on the front legs (not extended), the rear legs will swing down and spring into the locked position with about 1 in clearance. 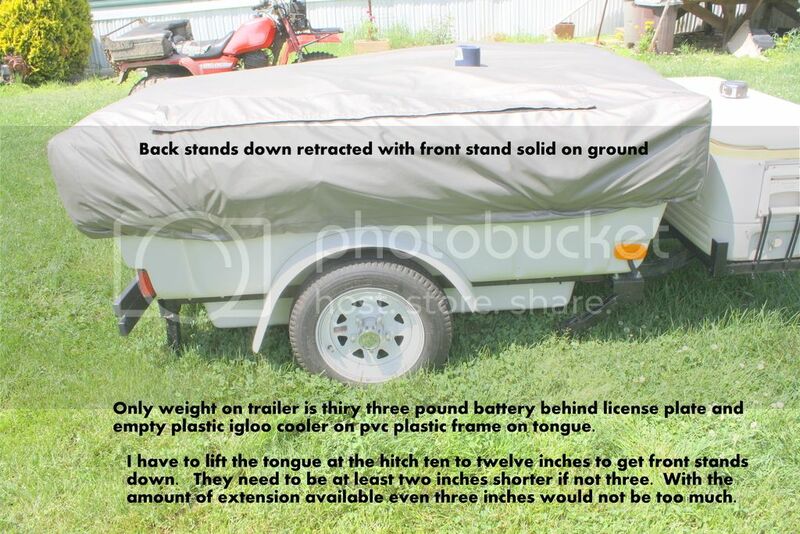 So... before you remove the trailer from the ball ... put the front legs down... unhitch the trailer and move it to where you want to set it up... put it down on the front legs to swing the rear legs into position.... now level the trailer front to rear... then side to side. From what I can see from photos ... the old legs with the multi-hole channel could be easily shortened by removing one section (hole to hole) and moving the rivets or bolts . 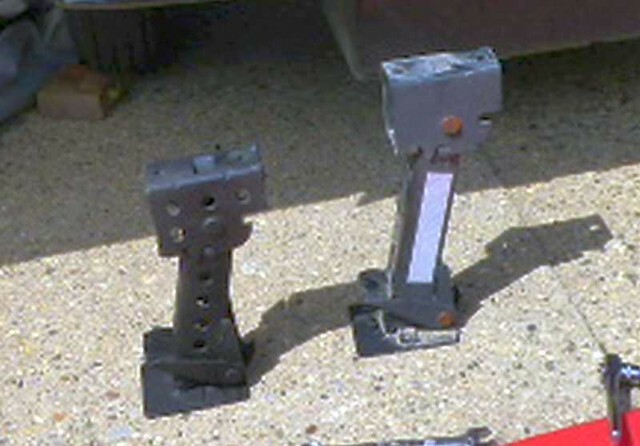 The new legs are solid sided with stamped dimples that cannot be easily modified. Looked at them again today and at the dimple that I was going to section the legs in the middle to keep the dimple. I now think all I have to do is cut the pivot end off and weld a piece of metal on to duplicate the dimple. Either way we go, back down first or front down first the opposite end will not swing down. It does not make sense. The back will not swing down without having the tongue almost on the ground. The fronts will swing down if you have the tongue raised up. However the opposite ends will not swing down. Their pictures show it on concrete. Our camping and other set up has not been on concrete. They are just too long even if they will swing down. Who needs to raise the camper up so high they can change the tire? Of course if you camp on the side of a mountain it would be helpful. Here are pictures of what we have going on. Maybe you can see my problem. 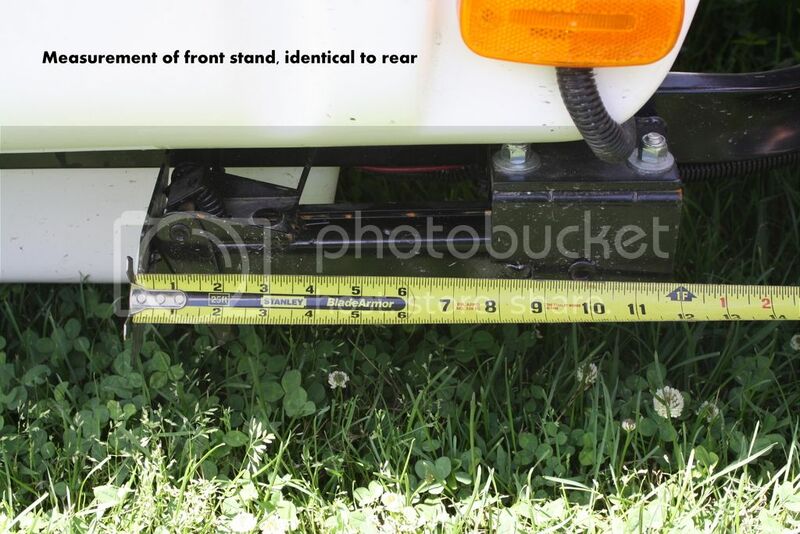 The proper measurement on the jack is with the jack stand in the down position. Your situation looked just like mine did, except my back ones seemed lower than yours by a little more. The 13" tire would help immensely I am sure. But being hard headed I am either get Aspen to rectify the problem or I will simply cut the stands by 2". Do not get me wrong, I am totally impressed with Aspen and their people. I know they are buying off the shelf stands from outside suppliers and this is probably the one closest to what is needed. It just aggravates me that one cannot swing all 4 of them down freely with the trailer at level rest. What is going to happen when we get loaded for our out west trip with the A/C unit in the belly? Once they are down leveling is rather easy. I really do hope that you can find a solution that satisfies you and please keep us informed of whatever solution that you come up with!!!!!!!! There is always more than one way to skin a cat. I got dome first hand exerience with the jack stands this weekend. I set it up for the very frst time at my Grand Daughter's house in Duncan Falls Ohio on Saturday night (in the rain) and the stands did give me issues. I think they may have been a little sticky from nonuse as well. I put the trailer in position and dropped the tongue to the ground. This allowed me to bring down the rear stands. I then lifted the tongue up high enough that my helpers could bring down the front stands. This is NOT something I will be willing to do very many times so a solution (for me) will have to be found. I repeated the process at home in my backyard last night but this time I pushed it up onto a couple of 2X6s to get it a little higher, it made it a bit easier to manage but still not perfect for me. Has anyone tried any sort of screw jack mounting on the tongue? My old camper the process was to lower the front as low as you could get it, place the back jacl stand against the ground and then raise the front up using the screw jack until the wheels of the traile actually came off the ground and the trailer was near level, then place the front stands and lower it down on to them for level. With the tongue jack you already have, which is like all the other stabilizers, if you use a 3/8" steel bar (or long heavy screw driver), you can put the tongue on the ground, lower the rears, raise the tongue to lower the stabilizer, then jack the tongue stabilizer up using the bar (or long screw driver) till the front ones an come down. Once all four are down, lower the tongue stabilizer, and jack each stabilizer as needed to level the trailer. The wheels do not have to come off the ground. I think I need some practice "jacking" with the 3/8 steel bar or screw driver! Go To Topic Listing "Aspen© Lightweight Camper Owners"